We are Grinches by nature. We get a warm feeling inside us when we see someone happy - well maybe burning is a more appropriate word. And so we start going out of our way to put out that beacon of hope that the happy radiate. And we do so with extreme accuracy. The holidays are here at last. Wake up and be filled with joy. Let us then watch a Christmas special with the kids, shall we? But wait why is the electricity gone? It's a winter morning and a holiday, absolutely no reason for a load-shedding. But the folks at DESA don't care - why did you dare to be happy you fool. "Are you having a holly, jolly Christmas?" But who needs technology for entertainment, right? Let's take the kids out, there's always that park they wanted to visit. And besides, there could not possibly be a traffic jam today of all days. So you thought. The Asinine Lobsters and the Bloody Nitwit Piranhas are at it again, and the roads are blocked by a very excited women shouting away, making the microphones in front of her obsolete. At last you reach the destination, all the while talking yourself into relaxation. It's no big deal. Breathe in, breathe out. But now the C.N.G. driver thinks that the price agreed upon earlier was too low and wants an extra fifty. It's all you can do not to hit him and just for the day's sake, you comply. So you look around the rides and something weird strikes you, half the rides are closed due to maintenance and the other half has lines extending miles. Most of the people in the line are grown ups and to make it worse, people are cutting into the queue every five seconds. From an ensuing brawl a separate line has been created and you are not sure, which to stand in any more. After a long hectic wait, you reach the ride which lasts only a disappointing ten seconds and you drag your kids all the way home again. And somehow miraculously you haven't yet lost your holiday spirit. Then you meet the neighbour downstairs who gives you the long speech you have heard a thousand times before on how the country is going down, the government isn't functioning, how nothing can ever be done right in this country, there's no future here and lastly, how he could have done such a better job had he been the one to wield the power. At this point even the very optimistic may break down. It seems everyone out there is hell-bent on making you miserable no matter how much you want to remain happy. But at the end of the day, when you think about the small things, the weirdness only seen in our country, the small laughs, you cannot help but smile. The country, it seems, is the Grinch but ironically it's our hearts which grow three sizes larger every time we defend our reputation. And besides, everything works out in the end, more or less and after a week you have a great story to share. I receive a scarf in the gift bag purple, woolly, obviously more expensive than something from the sales rack at Wal-Mart. An early Christmas present from a friend down the hall, a friend who will go home to her family after the end of finals week and trim a Christmas tree and hang up stockings for Santa and drink hot chocolate with marshmallows before Christmas dinner. My friend meant well, I know, so I knot the scarf the way I see the other girls on campus do it and venture out into the pre-Christmas cold. The grass is still frosted, even though it's ten in the morning and the sun is warm on my face. I wiggle my hands into the mittens my mother had sent, with love and concern, from Texas. “You look like a baby Eskimo,” someone comments, jokingly, and I don't know whether to half-smile or scowl. Familiarity or rudeness, it's difficult to decide. I am on my way to breakfast, scrambled eggs and home fries and sausage links, in a dining hall that's brightly lit despite the sunlight and where the people milling around are various shades of vanilla. I could pass as one of them, I suppose, in my winter coat and purple scarf and no-longer accented English. I slide into the booth that my friends have staked out. 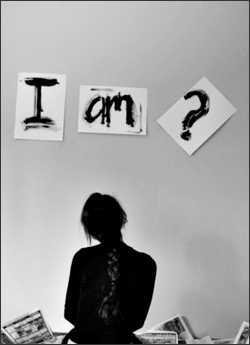 “Am I a self-hater?” I ask them, bluntly, suddenly, and for a second I am met with a stunned, awkward silence. “Huh.” This is a revelation to me. True, nothing about me appears outwardly Bangladeshi. I am darker-skinned than my vanilla friends. I watch the Food Network and Comedy Central with him. I keep up with celebrity gossip. I read books on eighteenth-century London, and enjoy them, and then I go to my feminist film theory class and discuss psychoanalysis and the male gaze and I am just as home with the academic banter as the others around me. 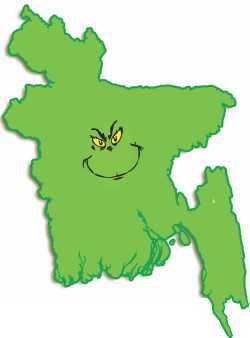 I work at the library and I give tours around campus, and when families ask me where I'm from and I say “Bangladesh” I am often met with a confused, slightly incredulous look. I am from Bangladesh, but I think the Bangladeshi in me has been watered down. Out of choice, and out of necessity. “You're a coconut,” a friend from yearbook had told me senior year of high school. “Brown on the outside, and white on the inside.” I had laughed it off then, but I suppose she was right. I enjoy my curry, I enjoy cooking bhaat and daal and turning up my nose at the bland fare we get served at the campus dining halls. I bring up my “post-colonial angst,” as a joke most of the time. I talk about how I bring diversity to my vanilla campus, and how it's only a matter of time before Admissions photoshops my face into a brochure. I say these things in jest, but maybe it's all true, maybe the gradual whitewashing of my brownness has taken over. I may have my mother's mango pickle on my dresser, and I may still know the chorus of “Melay jaire” by Feedback, but in the evenings when I come back from class or from work I tune in to Iron Chef America or reruns of Scrubs. The only time I speak in Bangla is to my parents, a few times in the week, over the phone. I pronounce words differently, tripping over the “day” of “today” and the “p” of “impetus.” Other than that, I am a coconut, a self-hater as they say, not hating where I come from but malleable in the hands of where I am at the moment. Being moulded and shaped, certain things getting wrung out of me, my innards piped in with something else. On December 16, 1965, astronauts Tom Stafford and Wally Schirra sent this broadcast to Mission Control: “We have an object, looks like a satellite going from north to south, probably in polar orbit... I see a command module and eight smaller modules in front. The pilot of the command module is wearing a red suit...” They then brought out the harmonica and sleigh bells they had secretly smuggled on board and sang Jingle Bells. 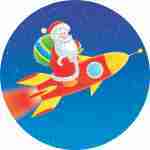 US scientists calculated that Santa would have to visit 822 homes a second to deliver all the world's presents on Christmas Eve, travelling at 650 miles a second. Around 1.76 Billion Candy Canes are made around the world every year. The world's tallest Xmas tree at 221ft high was erected in a Washington shopping mall in 1950. That's roughly the size of a 35 story building. The term Mistletoe comes from the Anglo-Saxon word misteltan, which means “little dung twig” because the plant spreads though bird droppings.